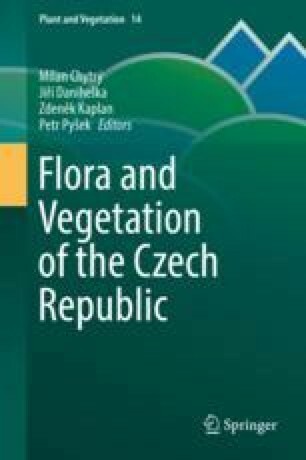 A basic overview of the current state of knowledge on the lichen biota in the Czech Republic is provided. Lichens of particular interest, e.g. those described from this country, globally rare species and endangered bioindicators are dealt with in more detail. Important lichenological localities in this country are briefly mentioned. Biogeographical aspects of Czech lichen biota are discussed and examples of various biogeographical elements given. Changes in abundance, especially of epiphytic lichens, both on a long time scale and in recent years, are evaluated, especially in relation to the latest national Red List of lichens. The phenomenon of recent recolonization and gradual spread of nitrophilous and previously rare or new acidophilous lichens is outlined. I thank František Bouda, Josef Halda and Petr Uhlík for providing photographs, Ondřej Hájek for preparing maps based on data extracted from the NDOP database of the Nature Conservation Agency of the Czech Republic, Milan Chytrý, Jiří Danihelka and Marinus Werger for improving a draft version of the text, and Tony Dixon for English proofreading. This study was supported by the project no. RVO67985939 (Academy of Sciences of the Czech Republic).